Here is our curated collection of must-see sights in the Brandywine Valley and surrounding areas. After 40-some years of covering our special corner of paradise, we’ve got a very personal collection of gems to share with you to make for a great summer. To visitors, new neighbors and longtime residents, we hope you find plenty to enjoy. And let us know what we should add next year! Download the print version of the July guide intro here and the Day Trips and Outings section here. A good starting point for your tour is the three most popular attractions—Longwood Gardens, Brandywine River Museum of Art, Winterthur Museum, Garden and Library. Then we’ll take you to other stops worth a quick visit or a leisurely tour. Your choice. TOP TIP: The Brandywine Treasure Trail Passport gives admission to 12 major sights for a flat fee ($45/adults, $95/families), BrandywineTreasures.org. The BIG news is local libraries have a FREE museum pass program. Check online for details. TIP: Blue Star Museum programs offer active-duty military and their families free admission. Check at Arts.gov/National-Initiatives/Blue-Star-Musuems. Although open year-round, Longwood Gardens truly shines in summer when the 1,083-acre legacy of founder Pierre S. du Pont attracts a good portion of the million-plus annual visitors. 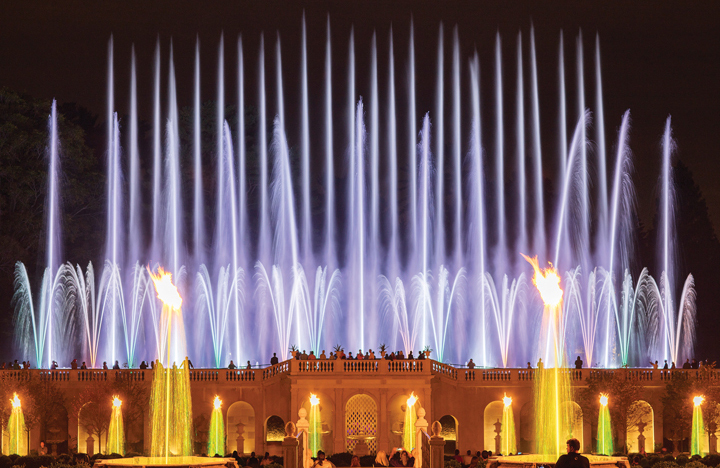 We think summer is the best time to enjoy the Main Fountains at Longwood Gardens, now in their second season as part of the “Festival of Fountains.” Dazzling daily fountain shows featuring 1,719 jets of water, glorious gardens, live music and special events make the dancing fountains, light shows and five nights of fireworks (July 1 & 21, Aug. 11, Sept. 1 & 29) a top stop. 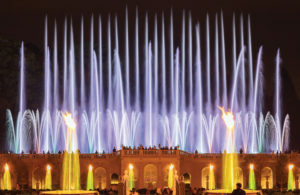 Fountain shows through September 30. Fabulous fountains aren’t the only reason to visit what National Geographic Traveler calls a “National Wonder.” The Italian Water Garden, aquatic garden, meadows, woodlands, new allee and grotto plus formal gardens invite leisurely strolls. Longwood is also an entertainment venue, hosting 400 performances a year. For family-friendly theater, see The Brandywiners performing The Music Man, July 26–28 and August 2–4. Classical music buffs should reserve seats for the Kennett Symphony’s “A Midsummer Night’s Concert” on August 18. Picnic in designated areas or enjoy a Victory brew at the Beer Garden to extend your stay. Open daily. Rts. 1 & 52, Kennett Square. LongwoodGardens.org. 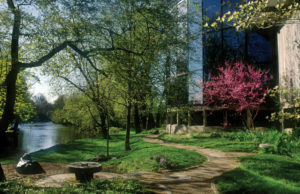 For a garden on a smaller scale, plus a world-class museum, next up is a visit to the Brandywine River Museum of Art on the banks of the Brandywine River. Home to works by three generations of Wyeths—N.C., Andrew, Jamie—plus regional art, American landscapes, still-life paintings and illustrations, the museum is surrounded by an extensive native plant garden studded with sculpture. This summer, see 13 artists’ depictions of the fierce magnificence of nature in “Natural Wonders: The Sublime in Contemporary Art” through October 21, and explore the social function of portraits, from the traditional to the witty in “The Serious and the Smirk: Portraits from the Collection” from July 14 through October 28. Tip-A-Canoe and Barbecue, Too outing, July 25 Summer Garden Walk and September 22 Bike the Brandywine ride. Open daily, Rt. 1, Chadds Ford. BrandywineMuseum.org. TIP: Time your visit to enjoy a seasonally inspired, locally sourced meal prepared by new Chef Mike Kline at the on-site Millstone Cafe. You’ll also get a stunning view of the Brandywine River from floor-to-ceiling windows. One of 36 stops on the newly created Delaware History Trail, Winterthur Museum, Garden & Library is our number three top stop and home to American decorative arts displayed in a stunning mansion set in a landscaped 1,000-acre park, once the home of Henry F. du Pont. In addition to an astonishing 90,000-piece collection, you’ll find a Touch-It room for kids. 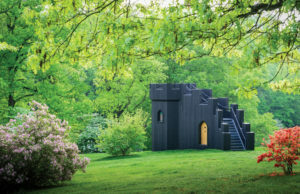 This year’s major attraction, ”Follies: Architectural Whimsy in the Garden,” features 13 whimsical garden structures—from a faerie cottage to a Gothic Tower (in photo)—on view through January 5, 2020. Summer events include music, a beer garden and tram tours. 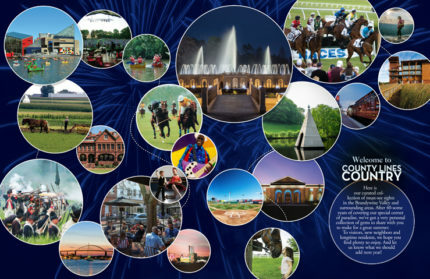 Find out more online at CountyLinesMagazine.com. Visitors may prefer to tour the gardens in a tram or meander across acres of rolling hills, streams, gardens and forests as you search for the reflecting pond, glade, azalea woods and pinetum. For kid-friendly fun, there’s the Enchanted Woods, a three-acre fairy-tale style garden including a Tulip Tree House. Open Tues.–Sun. 5105 Kennett Pk., Winterthur, DE. Winterthur.org.